As part of the process, the class made a map of sounds! This project was a bit difficult for me to conceptualize and present in an easy-to-understand manner. Because English is not the mother tongue of most of my kids, I thought they would have a hard time "picturing" what sound looks like. But I did my best and gave the children fingerpaint and let them go wild. To my surprise, many of them "got it" and what looked like colorful messes had a logic behind it. One boy in particular, who many describe as older than his 4 years, told me which colors corresponded to the quiet and nosy times of our day at the kindergarten. Pink is quiet, like our lunch time. But our morning circle is blue because it is loud. Green is quiet with some loud times. 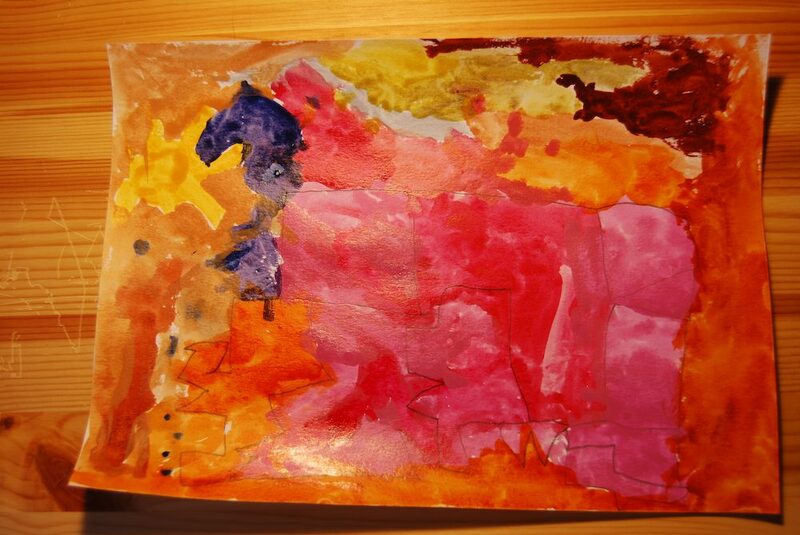 The surface that I gave the children to paint on was plain white paper with a pair of ears on the left and right side. They all recognized the ears and some painted the entire surface with wild abandon, while other concentrated on decorating the ears first and then coloring the empty space between them. When all the pieces were finished, I wanted something that would show the thought process of the children individually and the class as a whole. So I decided to create a map of the world and use the children's artwork to create a patchwork of the continents. Each patch was clearly marked with the child's name, so that they could find it on the map. The boy I spoke about earlier applied his color logic to the map and theorized that different areas of the world must be quiet or loud according to the color of the patches used. Diego: I have a car and a big window. Ivanna: My house is brown and white. Leo: My house is big and there is a tree, I live with my parents and siblings. Gonzalo: My house is red, it has two floors and I have a white car. Romina: My house is white and with a big tree. We hope you enjoy it as much as we did, thank you for this fantastic experience!!!!! Happy New Year for all of you!! Ms. Angie and her group K2 "A"
Ms. Angie and her group of 4 year olds artists from Colegio San Patricio in Monterrey, Mexico are making and sharing art with Lusin Boyajyan from Kita Felix and Friends in Berlin, Germany. Creative inventors in Berlin find a way to reach their friends in Mexico! I am happy to send you some pictures of our creative discoverers from Berlin. Emil: under there is water and up there is air and we break the air to get to Mexico. Raphael: From Germany we take a submarine and it sinks totally under the water. The clouds make lots of fog and we cannot go further for a time. Basti: We take the submarine and the sun is there, the full moon and the earth. In case someone attacks us (the sharks) we can take the other submarines. Aya: We can fly with an airplane and drive with a car. There is enough splace for my mama and papa. Tarja: These are my parents and me. We build a bridge to Mexico and walk there. Samira: We are in Germany and we go always around and around and when we want to go to Mexico we have to go out of this circle and take this way. This boat has wheels and this is an airplane and a smaller airplane. 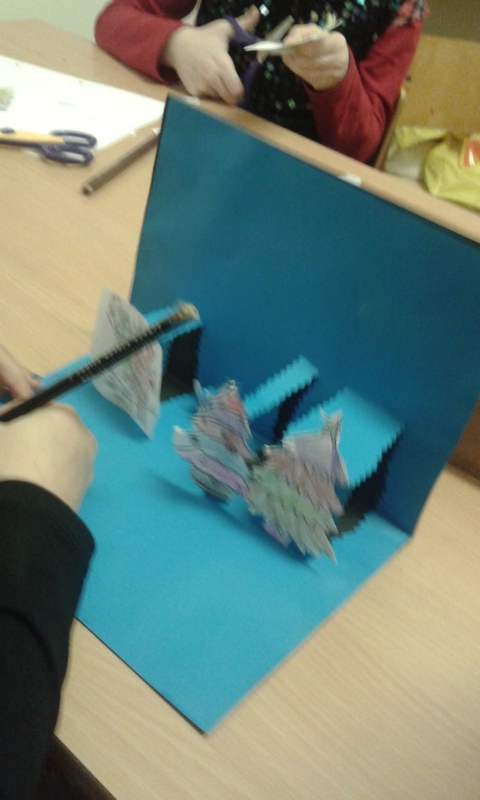 Sonia: This is a girl who swims to Mexico. She puts up wings so that she can fly over the water. The airplane broke and the submarine broke as well. The girl has left her mask in the broken airplane. The sun gives warmth to the girl. The girl takes the snail to Mexico because the snail lives there. Leiff: The boat pulls the car all the way to Mexico. Mia: It's a car with ten wheels. This car can go up because of the sticks and the airplane can fly the car behind it. We go to Mexico all together, my four brothers and sisters and my father and my mother. 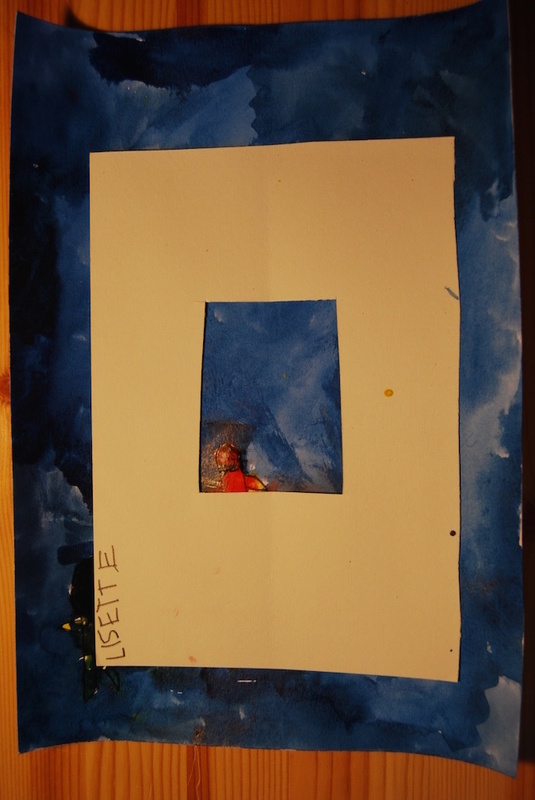 Leyla: There are two boats, a ship and a submarine, my family goes in a ship and I am in the submarine alone. The airplane is for the seagull that wants to go back to Germany. Best regards and thank you very much for organizing this beautiful project. 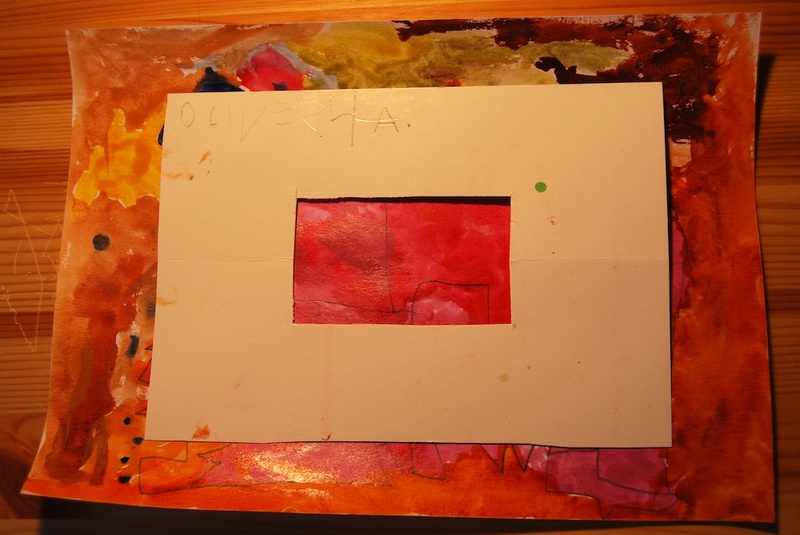 Lusine Boyajyan and her group of 4 year olds artists from Kita Felix and Friends in Berlin, Germany are making and sharing art with Angy Castillo and her Kinder A group from Colegio San Patricio in Monterrey, Mexico. I am happy to send you some pictures of our wonderful artworks. 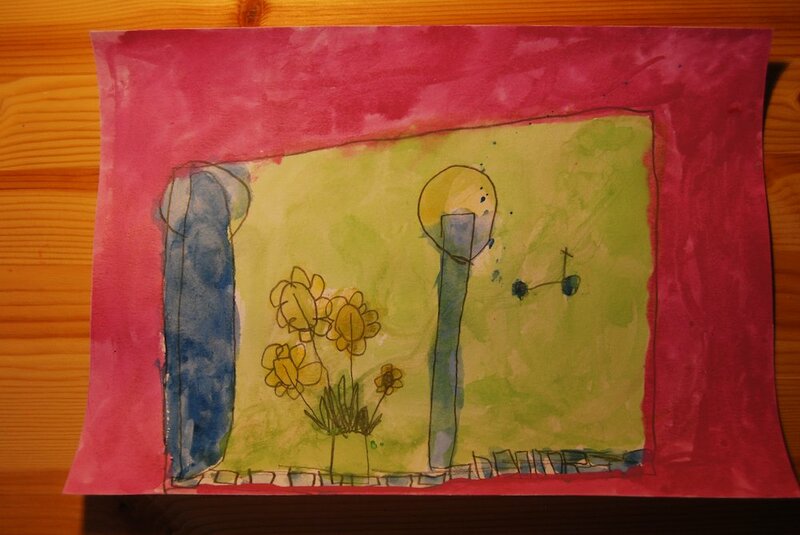 Our kids depicted our environments as they see it - full of autumn colors and favourite places. You can hang our environments both from day side and from night side, they are equally beautiful! We were delighted to receive a parcel from Mexico. The fishes found a comfortable place in our room, even made friends with our fishes! The Layers of Love from Berlin! 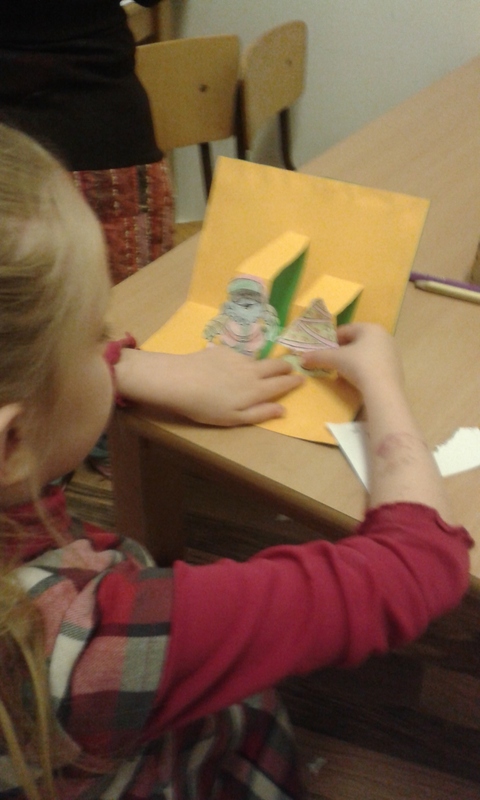 I am happy to send you some pictures of our scratch project and the amazing stories of our creative artists. Our kids were delighted to see the new colorful images coming out as they scratched using very different tools: plastic forks and knives and other sharp objects. Some of them depicted inside of the place where the character lived, others displayed the outside. 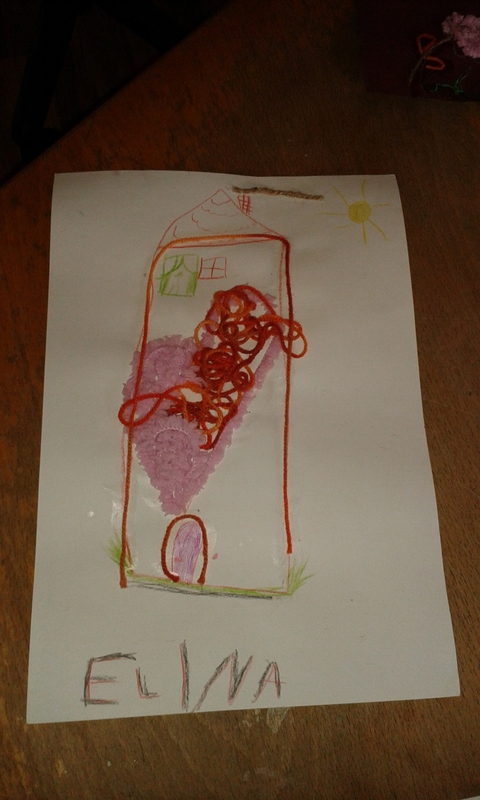 Basti: This is a house with a chimney and smoke comes out of the chimney, down there is grass and the sun is up in the sky. Here I have a door and two windows. And here is my bed. Raphael: This is a house. Out of the chimney comes a thick smoke. It has a door and windows. Near the house explodes an askumet. In the front of the house are large cobblestones. Leyla: It's a man with a house, a letter box and a tent. The house is full of ghosts. The doors and windows are broken. In the left corner is a heart for the monster. Maya: It's a scratch tree. It has leaves and they have different colors. It was a cat who scratched it all about! Linus: It's inside the place but it's not my place because my place is very far away. 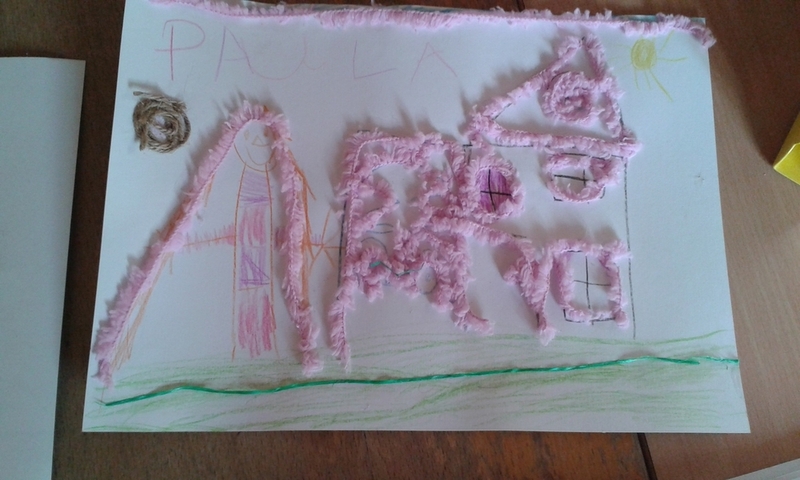 Aya: It's a house. A heart. It's my house. It's raining outside and snows sometimes. Lyn: I was in my room and my sister was in her room. My father wanted to go to Aldi (supermarket) to shop and then there were two monsters next to the house. The monsters were nice and wanted to get married. The sun war shining and my sister looked out of the window and so did I . The girl monster had a necklace. Tarja: This is inside the house. There is one circle inside it. There is an umbrella with a very long holder. Here is a 4, that's how old I am. I am sending the parcel out today, hope it arrives soon and safe. And our friends in Mexico like our pictures and stories a lot. Happy to send you some pictures from our project, Lights, Camera, Action! Kids were excited to make their characters and to expand as they created more. I send you our small stories and some pictures. The rabbit goes for a walk. The rabbit melts because of the sun. This is a monster. He likes stones and sweets. He doesn't like mashed potatoes. This is a nice ghost. He eats meat, especially pork. He plays ball. This is my mother. She goes for a walk and then to her work. She likes to eat rice and meat at home. 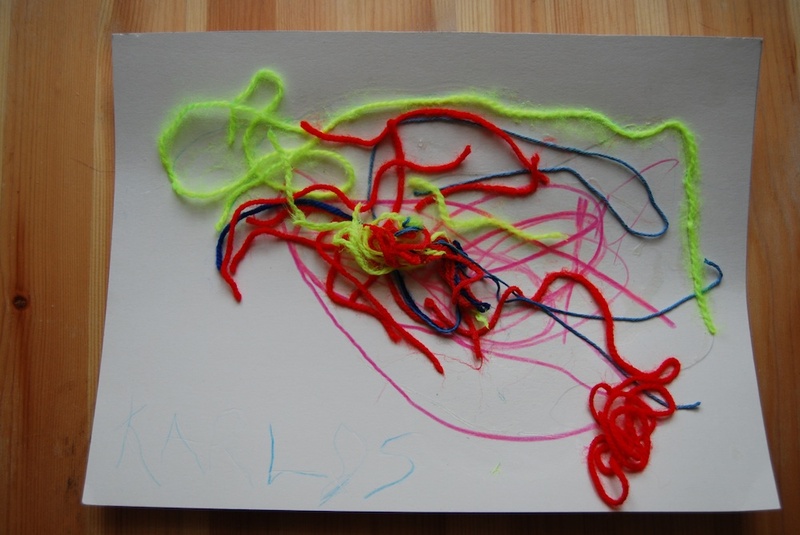 Lusine Boyajyan and her 4-5 year old artists from Kita Felix and Friends in Berlin, Germany are making and sharing art with the 4-5 year olds with Angy Castillo and her Kinder A class from Colegio San Patricio in Monterrey, Mexico. Prior to receiving the project description, I was nervous about the supplies the project would need and if it would be age/ language appropriate. While most of the children I work with have at least a basic understanding of English, there are several that have no common language with the class, meaning that they speak neither English nor German. Therefore, class projects must be visually based to maintain accessibility. And even though Munich is a major city, simple supplies, like contact paper, can be difficult to obtain. The project, “Light, Camera, Action” exceeded my expectations. It was specific without being restrictive and easy to incorporate into the previously scheduled classroom activities. The current topic for our class is animals. We recently concluded our discussion on animals of the sea and were moving into land animals when we received the topic. We directed the conversation specifically to pets and asked the children to name all the different types of pets people keep. Many of the children do not actually have pets, so we asked them which kind of pet they would like. We then discussed the personalities their animals would have. The kindergarten has two rabbits that are “everyone’s pets” but the children decided that rabbits are outside animals and would not make good pets. To incorporate the use of light into to project, I showed the children pictures of stained glass portraits some people make of their favorite animals. The result was our version of stained glass, depicting cats, dogs, birds, and fish. They helped pack their artwork in a large envelope and are excited for their new friends in Mexico to see them. And they can’t wait to see what the other children created. 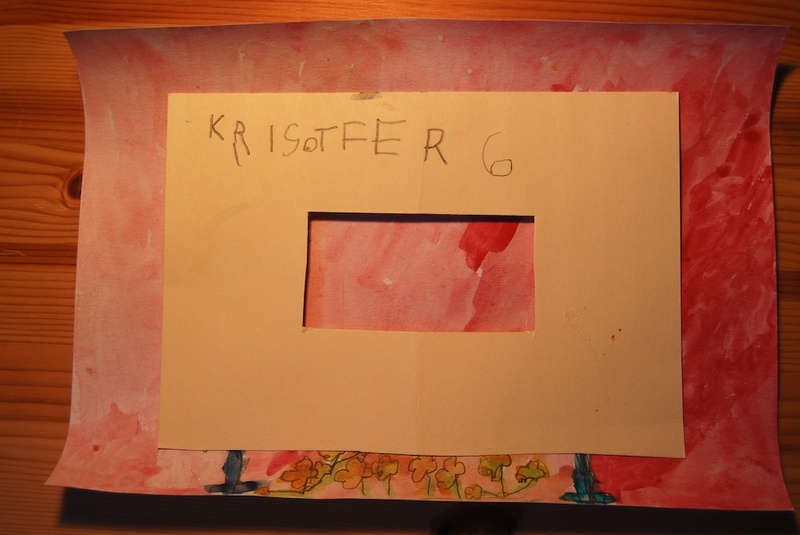 The 4-5 year old artists at Elly und Stoffl kindergarten in Munich, Germany are making and sharing art with the 4-5 year olds in Kinder D at Colegio San Patricio in Monterrey, Mexico. Töös osalesid lapsed vanuses 4-5 aastat: 6 poissi. Tööprotsess neile meeldis. Eriti see, et sai valida mitmesuguste pliiatsijoonte vahel, millega pind täita. Vaatasime rühmaaknast välja ja leidsime oma silmapiiri - taevas ja maa. Sellest tulenevalt ka värvid sinine ja roheline. Laste jaoks oli põnev koht, et piltidest kokku tekkis justkui pikk maastik orgude ja kõrgndikega - meie Lõuna-Eesti maastik. Ja meile õpetajatele, mulle ja Lissile, meeldib lastega kunsti teha ja seda protsessi kõrvalt nautida. Aitäh meie igapäevaelu rikastamise eest! Most of kids from our pre-school have viruses, therefore only half of the group is together. 6 boys, aged 4-5 years participated at the project. They loved the process. Specially, that they could choose between different pencil lines with what to fill the surface. We looked out from window and found our horizon- sky and earth. From there the colours: blue and green. It was also interesting for kids that pictures together made long spanning landscape, with valleys and heights- our Southern Estonian landscape. 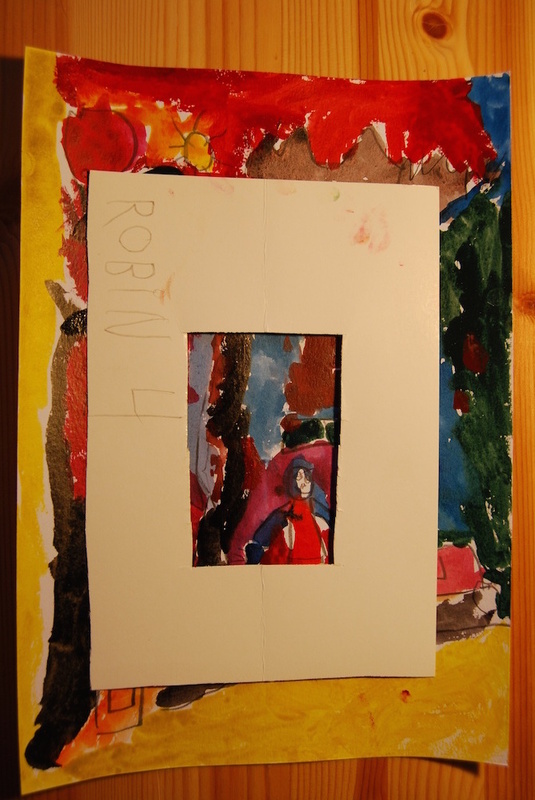 And for teachers, to me and Lissi, we love making arts with children and enjoy the process. Thank you for enriching our everyday life! Thanks to Evelyn Müürsepp for the English translation! The pop up technique was familiar to some of them and they asked for little instructions and worked more independently. It was a fun experience for all of all. 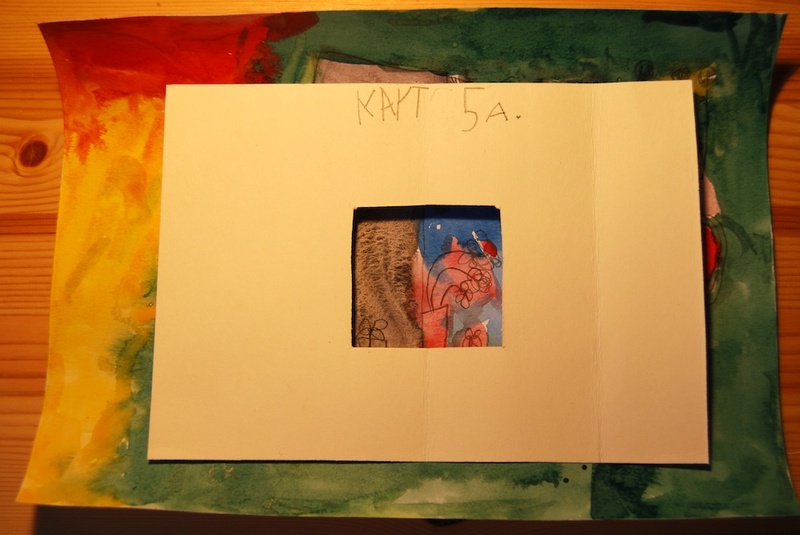 The 4-5 year olds from Kita Felix and Friends in Berlin, Germany are making and sharing art with The Smart Squirrels, a group of 4 year olds from Açı Preschool in Istanbul, Turkey. Super Imaginary Me Puppets from the Smart Squirrels ! We are very excited to join in DearYou Project as the teachers, so do children :). When the teachers introduced the Project from the website of “DearYou” Project, they got excited and wanted to start quickly. They were happy to create their imaginary friend and talk about the features and the abilities they have. They used art materials and their own drawing to finish their work. We hope you’ll like the products as much as we do. To see more of The Smart Squirrels Imagine Me puppets, please click here. The Smart Squirrels are a group of 4 year olds from Açı Preschool in Istanbul, Turkey. 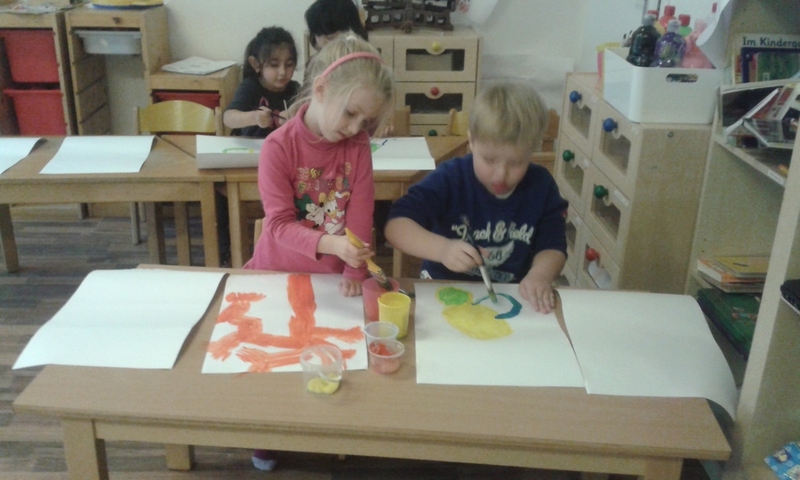 They are making and sharing art with the 4 year olds from Kita Felix and Friends in Berlin, Germany. Sun catch the rays in Berlin! Here are some pictures of the sun catchers the artists in Berlin made. 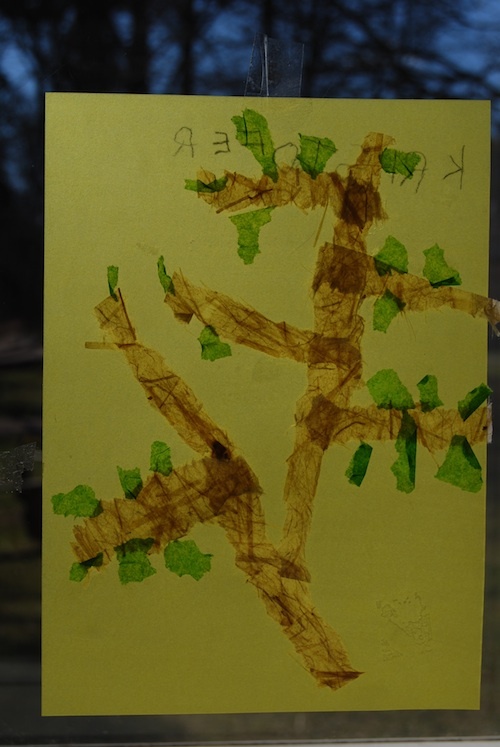 Lusine Boyajyan, the teacher of the 5 year old artists at Kita Felix and Friends said, "We had a great sunny day and the kids were happy to explore the light and drawn pictures, the shadow of fingers behind the transparent paper...was a lot of fun :-)"
These artworks will brighten up Ahja's artists' day! Evelyn and her artists in Ahja, Estonia have been waiting for a sunny day to take these pictures. The sun finally came and look how beautiful these artworks are! I am sure these will make their friend's day in Berlin a shiny one! Berliners find amazing color combinations! 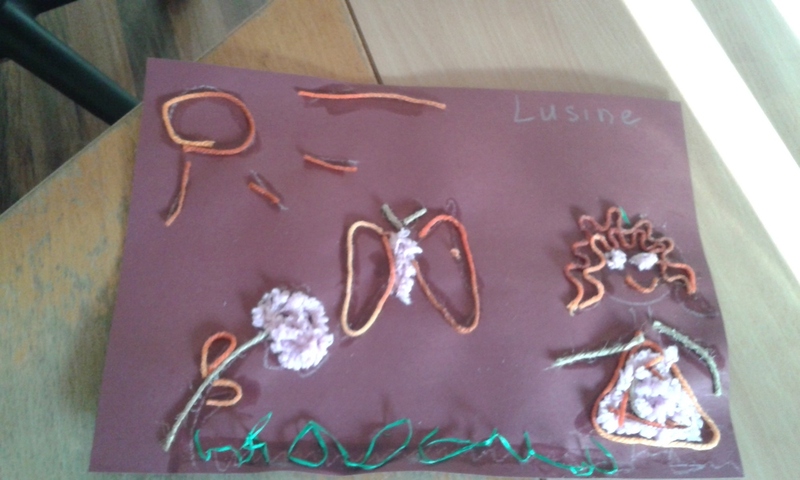 Lusine and her 5 year old artists from Berlin had a great time with their Dear You March project! I am sure Evelyn and her artists in Mooste, Estonia will appreciate their watercolor views. We split the project into two. First the kids made and used their viewfinders to fix images, colors and different combinations. 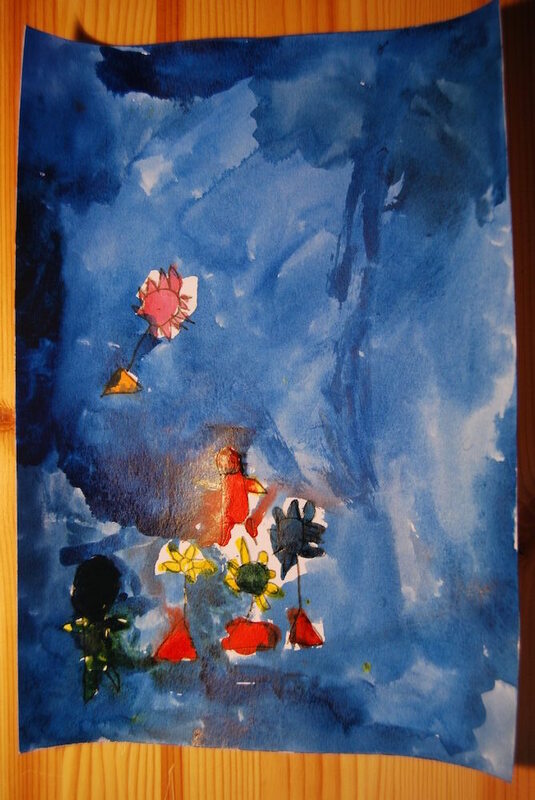 It was interesting to observe that later on when they were asked to put their creativity onto paper, they knew exactly what and how they wanted to paint. 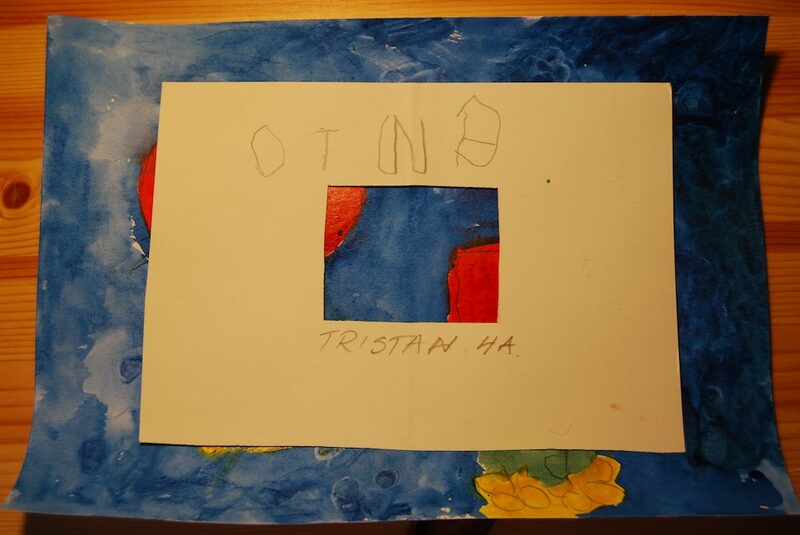 In between, they were encouraged to use the view finders again, which they applied from different distances involving other kids to hold the painting or to look through their view finders. We had a lot of fun and discovered many new things around us. Evelyn Müürsepp and her artists have made beautiful paintings with the help of their handmade viewfinders. I love how they use their viewfinder on their newly created painting. Perhaps we can make a painting in a painting? Anything is possible! I'm sure their friends in Berlin are going to be so happy when they receive these artworks! String stories together between Estonia and Germany! 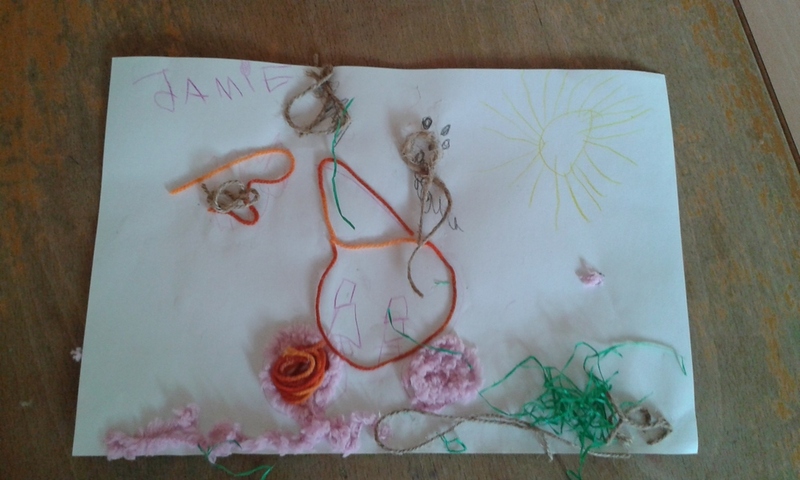 The artists at Lasteaed Illikuku in Põlvamaa, Estonia have made their stories by collaging string for their friends at Kita Felix and Friends in Berlin, Germany.